Google’s premium stock Android offering, the Pixel 2 and Pixel 2 XL are officially here and aside from showcasing that fluid OS as a result of running the purest form of Android, there are other specifications, features, pricing, and fundamental details that we are going to be bringing to your attention. 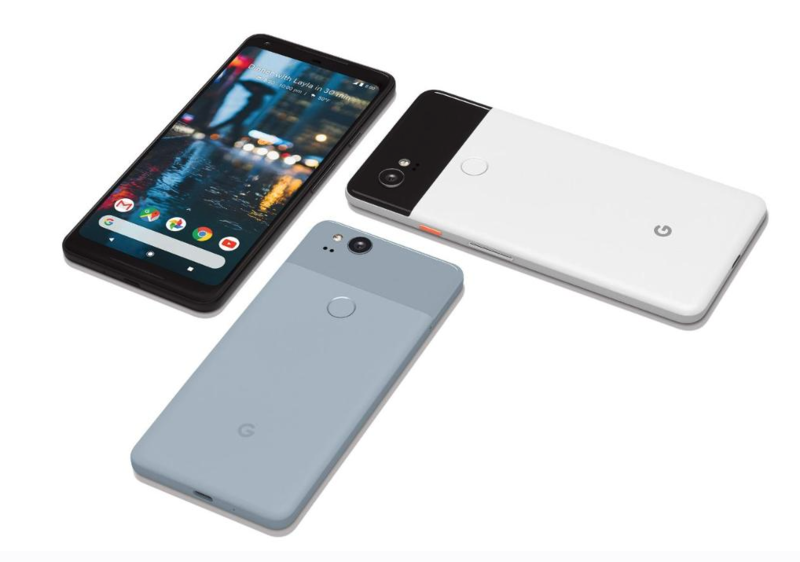 Bearing the same approach as Google with its 2016 Pixel family from the backside at least, the Pixel 2 and Pixel 2 XL now bear different screen sizes: a 5-inch display for the smaller version and a massive 6-inch screen for the bigger variant. The larger Pixel 2 XL features an OLED display, resulting in brighter colors with a more in-depth contrast when it comes to the display. The power button is now bright orange, allowing users to distinguish between what buttons they will press when they whip it out of their pocket. The entire structure of the phones is comprised of aluminum, making them lightweight, but extremely durable at the same time. The fingerprint reader is present at the rear side just like last time but it is in an ‘easier to reach’ position than the position placed on the Note 8. Stereo speakers are not common on bezel-less phones and while the Pixel 2 and Pixel 2 XL are not categorized in the bezel-less smartphone category, these speakers will mean that users will get to enjoy their media consumption sessions a whole lot more. Unfortunately, there is no headphone jack present on either device, meaning that you will need to purchase aftermarket dongles if you want your previous audio peripherals to become compatible with these mobile phones. Both flagships feature an ‘Always On’ display that will show you notifications without turning the screen on, which will obviously conserve battery life. There is also a ‘Now Playing’ feature that will work like Shazam. The Pixel 2 and Pixel 2 XL are IP67 water-resistant. This is not as effective as the rating on the Galaxy Note 8 but it will still do the trick in keeping water and dust at bay for a limited period of time. The acquisition of a portion of HTC’s smartphone business has brought up the squeeze feature on the Pixel 2 and Pixel 2 XL, whereby using machine learning, the devices will be able to identify which squeezes will be intentional in order to bring up contextual options for the user without pressing a single button. Google said that the Pixel 2 and Pixel 2 XL are rated as the best smartphone cameras according to DxOMark. With the Pixel featuring a score of 89, the Pixel 2 has registered a score of a whopping 98 points on the review site, which is thoroughly mind-boggling. There is also a Portrait mode that will allow you to take images with a certain depth of field. Since there are no dual-cameras present, Google will certainly be relying on software to get the job done and before you ask, this feature is present on the front and back camera on both the Pixel 2 and Pixel 2 XL. Both phones also provide support for optical and digital stabilization at the same time, which Google is calling it the fused image stabilization feature. Both smartphones will be the first to get software and security updates and they will be running Android Oreo ‘out of the box’. There are rumors that Google is adding an extra year of software updates for the new Pixel 2 handsets. As for pricing, the Pixel 2 starts at $649 for the 64GB version while the Pixel 2 XL starts at $849. They’ll be available in Australia, Canada, Germany, India, the UK, and US. Here in the US, they’re partnering with Verizon. You can find more details about pricing and availability here. Putting the design aside, are you impressed with what both flagships have to offer? Tell us your thoughts down in the comments.